A good fertility program for your turf grass lawn is essential for eye-catching dark green grass and optimal growth that can endure for years. But it does not have to be complicated, and in fact the simpler it is, the better. What is important is that it is well planned and that your grass fertilizer is properly suited for your specific growing region. Most grass fertilizer sold on the market have some mixture of the three most needed nutrients utilized by grass, and most all plants for that matter. N-P-K. Nitrogen, Phosphorous, and Potassium. Grasses require about 16 basic nutrients for growth but these are typically the most deficient of the nutrients and the ones grasses utilize more than any other nutrients, excluding carbon, hydrogen, and oxygen which grasses pull from the air and water. When you look at a fertilizer bag, these are what the three numbers in sequence that you see represent. They represent the analysis of that particular fertilizer in percent by weight of that product. For example, you’re thinking about buying a 25 lb. fertilizer bag that has an analysis of 16-4-8. This means that this particular grass fertilizer is 16% nitrogen by weight, 4% phosphorus by weight, and 8% potassium by weight. A 25 lb. bag would therefore contain 4 lbs nitrogen, 1 lb. Phosphorus, and 2 lbs potassium. This is a simple calculation that will help you to determine how much fertilizer to buy when you know how many pounds of each nutrient you must apply to the grass or soil. To apply 1 pound of nitrogen per 1,000 sq ft: Divide 100 by the first number on the fertilizer bag to determine the amount of product to be applied per 1,000 sq ft. Example: If using a 16-4-8 fertilizer, 100 divided by 16 equals 6.25. Therefore, 6.25 pounds of fertilizer per 1,000 square feet will provide 1 pound of nitrogen per 1,000 square feet. To apply 0.5 pounds of nitrogen per 1,000 sq ft: 50 divided by the first number on fertilizer bag equals the amount of product to be applied per 1,000 sq ft. Example: If using a 15-15-15 grass fertilizer, 50 divided by 15 equals 3.33. Therefore, 3.33 pounds of fertilizer should be applied per 1,000 square feet to deliver 0.5 pounds nitrogen per 1,000 sq ft.
Repeat the same calculations for phosphorous and potassium requirements. 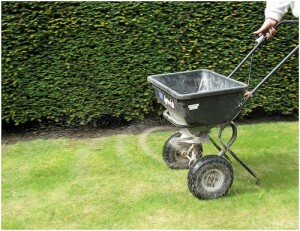 Visit the Spreading Lawn Fertilizer post to see this step done in action. Some grass fertilizer will also contain some of the other essential nutrients for growth such as, calcium, iron, zinc, sulfur, magnesium, and others. These are called micro-nutrients and are just as important as N,P, and K but are used by grass in very small amounts. Depending on your region and what nutrients are deficient in your turf grass, a grass fertilizer that also has micro-nutrients may produce great results in your lawn. When planting grass seed in virgin ground or a newly renovated parcel of land, it is always a good idea to take a soil sample of the area and have it analyzed for nutrient levels and soil texture. The soil texture will help you with what kind of soil amendments are needed to be added to improve soil structure. (More information on the Soil Preparation section on Planting Grass Seed page). The nutrient levels analysis will let you know what nutrients are lacking in the soil. With this information you can determine what blend of grass fertilizer you need apply and at what rate, or how much you need to apply per 1000 ft2 or per acre. Ideally you want to take 10 to 12 random samples 3 inches deep and mix them together. From this composite sample, take out 1 pint of soil for testing. When planting grass seed you typically want a fertilizer that has a high amount of phosphorous because one of phosphorous’ attributes is that it stimulates seedling development. This is a general rule but as stated above, a good soil analysis will take the guess work out the equation and save you a lot of time and money down the road. After your grass has been established, then you can adopt a fertility program that is designed to maintain your lush, green lawn. When planning for a general fertility program, a well balanced, complete grass fertilizer like a 15-15-15 or 16-16-16 is your best option. Again depending on special soil conditions or your specific growing region, a different fertilizer analysis may be more suitable, but for the most part a 15-15-15 or 16-16-16 is a pretty good starting point. This fertilizer blend is simple and widely available and it provides a balanced flow of the three most abundantly used nutrients. Adding micro-nutrients with this blend is also recommended. Below is a chart with suggested fertilizer requirements for a few different grass species. These recommendations are based off the annual nitrogen requirement for each grass because nitrogen is the most common deficient nutrient in grass and must be applied on a regular basis for vigiorous growth. But if you apply your nitrogen from a well balanced grass fertilizer with a good pack of micro-nutrients, you should not encounter any other major deficiency problems. You DO NOT want to apply a full years application in one single application. This would be a bad idea. Instead you want to spread out your applications over the months that your grass is in optimal growing conditions. For example, common bermuda grass nitrogen requirement is about 4-5 lbs nitrogen per year. You would want to spread about 1 lb. nitrogen per month during the months of March through September because this is when bermuda grass is most actively growing and when nitrogen can be utilized most. Nitrogen requirements for different grass lawns. For keeping your grass green through some of the cooler weather when grass is growing much slower, apply a fertilizer that contains iron. Iron based fertilizers are beneficial in promoting good turf color during colder temperatures. In the 1st place, how do I know what nutrients my soil need? How do I know how much sand, bonemeal etc my soil need? The best way to determine what nutrients and amendments your soil needs is to take a good soil sample from your lawn. A good soil sample analysis will tell you what nutrients are lacking, the structure of your soil, how much sand or clay your soil has, the pH, how many salts, and much more. Interpreting the soil analysis correctly is crucial so make sure you have your soil analyzed and reviewed by a qualified individual. I’m not sure where you are located but the best and usually free place to have your soil sample analyzed and interpreted is a local university cooperative extension office or college plant sciences or agriculture department. If these aren’t available, find a private soil testing lab in your area. Based upon results, they should also be able to give you an appropriate recommendation for your specific region. Generally you want to take 10 to 12 random samples 3 inches deep and mix them together. From this composite sample, take out 1 pint of soil for testing. While you are taking samples, if you have an established lawn, it would be a good idea to take a petiole sample or plant sample of your grass and have that analyzed for nutrient content as well. If had to choose to take only one sample though, I would concentrate on the soil sample because that is where your grass is ultimately mining for nutrients and a good soil sample analysis will tell you a lot. Once you know what nutrients you need and at what amount, you can use the formula above to calculate how much fertilizer to apply on your 54 square meter lawn. We would just have to do some simple math to convert square feet to meters and pounds to kilograms but same idea. I hope I helped answer some of your questions but if you still need more clarification, do not hesitate to make another comment on my site and I will address your concern as soon as possible. Without knowing the specifics of your soil, type of grass, and geographical location, it is hard for me to make an accurate recommendation, but if you are able to attain a good analysis of your soil, send me the results and I will give you an exact recommendation. You can get dozens of awnress for this question but we are going to suggest Native Plants or at least a good mixture in the total. Before choosing anything, you need to determine sunlight or lack of. That will affect your choice of plants. Most likely since you note it is void of anything, it is sunny.You also need to know what USDA zone you live in. The cold hardiness and even heat issues will also determine what plants you can place in your landscape. Once all of that is determined, native plants are an excellent choice. First they are from the place you already live in so soil might be fine and climate is fine. We like butterfly gardens. Buddleia, Coneflowers, Rudbeckias, Phlox, Agastache, Cardinal Flower, Great Lobelia, Milkweeds, Asters, Liatris, Bleeding Hearts, are native (excluding Buddleia). And once established use less water. All of these we listed will grow in Illinois.Toss in some Iris, Hosta, Salvias, Japanese Anemones, and some annuals such as Impatiens, Zinnias, Marigolds and you will have a fine garden. Add a birdbath and some large rocks as contrast and your set.But plan it on paper first, ensuring that large and tall plants are to the rear of the garden, smaller to the front. Take into account leaf shapes and flower colors as well. To make the shape of the bed, if you want curves, simply lay out a garden hose to see the curves you want.We have a website at SKWildflower-rescue.net that may give you some more ideas. A clean slate of a yard can be fun. And just to let you know, a garden is never done. We have been in our house in NJ for 16 years and we are always adding, changing, updating, etc. Have fun with it.